Sugar has gradually inched its way into our modern diets to the point where today it is in almost all the foods we eat, particularly packaged and processed foods. We don’t need it, it has zero nutritional value - it’s only there to satisfy our taste buds. The trouble with sugar is it is addictive. The more we eat it, the more we crave it. I know I do. Even though I’ve tried to cut down my sugar intake, I still occasionally get a hankering for something sweet and chocolaty. So rather than giving in to those sweet cravings, what else can we do? Well, there are several other options. One of the obvious solutions of course is to eat fruit. Fruit is sweet and satisfies those sweet cravings without adding calories. It also has heaps of other nutritional benefits. Fresh or dried is okay. But remember dried fruit is concentrated, the flavors are heightened and the sugar levels intensified, so you will need to eat less. The other alternative of course is to use sugar substitutes. These are increasingly finding their way into our everyday food, particularly foods that are labelled “sugar-free” or “diet”. What are the best sugar substitutes and are they really that good for us? Or they just another form of sugar? What are the different sugar substitutes? 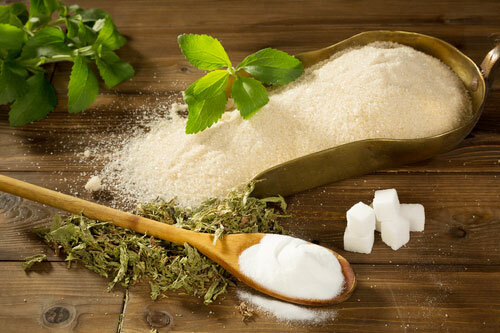 Sugar substitutes are roughly divided into four groups: artificial sweeteners, sugar alcohols, novel sweeteners and natural sweeteners. Artificial sweeteners are synthetic creations that have been processed or refined. These include aspartame (NutraSweet, Equal), sucralose (Splenda), saccharin (Sweet'N Low, Sugar Twin), acesulfame potassium (Sunett, Sweet One), neotame, and others. They are many times sweeter than sugar and are popular because they contain zero calories and don’t raise blood sugar levels. But some artificial sweeteners, such as aspartame and acesulfame-K have been linked to cancer. And while artificial sweeteners contain no calories, they also have no nutritional value. Sugar alcohols are carbohydrates that occur naturally in certain fruits and vegetables. Despite their name they don’t contain any alcohol, but they do contain some calories, about 2 calories per gram, which is less than sugar. As they are derived from carbohydrates they will raise blood sugar levels, but because the body doesn’t completely absorb sugar alcohols their effect is less pronounced than other sugars. Sugar alcohols include Erythritol, Sorbitol and Xylitol. They are found in many processed goods such as candies, baked goods, toothpaste and mouthwash. Novel sweeteners are combinations of different types of sweeteners. They are derived from natural sources but sold in refined or processed forms. The most common is stevia. Stevia is a highly sweet herb which comes from the stevia plant native to South America. Stevia is about 200 times sweeter than sugar, so unless you want your food ultra-sweet, use it sparingly. It is available in either liquid or powder form. Because stevia is not metabolized, it has a minimal effect on blood glucose levels making it suitable for diabetics, and it has no calories and no glycemic index. Completely safe in its natural form, it is a very useful way to reduce your sugar intake and, for my money, one of the best sugar substitutes. Natural sweeteners are found naturally in nature from vegetables, fruits or herbs. They are not overly processed or overheated, remaining as close as possible to their raw state. Because of this they retain many more vitamins and minerals than processed sugars. But it’s also worth remembering that most natural sweeteners still contain calories, cause a spike in blood sugar levels and can contribute to tooth decay. Most are very sweet, so you will need to use less to achieve the same level of sweetness. They may contain fiber (both soluble and insoluble) which helps regulate sugar absorption. They also contain valuable antioxidants, vitamins and minerals. Sweeteners such as honey have healing qualities. They are also not as addictive as sugar. Barley malt syrup is made from sprouted (malted) barley. Similar to molasses in texture this dark brown unrefined sweetener is thick and sticky with a distinct “malty” flavour, but is not as sweet as honey or white sugar. Low in glucose, fructose and sucrose with a low glycemic index, it is easily digested. This is a healthy substitute for white or brown sugar, but is really only suitable for baked goods such as cakes, gingerbread, muffins and dark breads. Is the residue after crystals of sugar are removed from beet juice or sugar cane. Although it still contains 65 percent sucrose, blackstrap molasses contains measurable levels of vitamins and minerals such as magnesium, potassium, and calcium. It may also contain up to 20% of your daily iron intake and 10% of your daily vitamin B6 intake making it more nutritious than most other sweeteners. It has a rich, subtle smoky flavour that some people may find slightly bitter. So it’s not always a suitable substitute for sugar. Made from boiling brown rice, which is then processed to filter out impurities, brown rice syrup is a thick, sweet-tasting syrup with a slightly butterscotch flavour. It is also becoming more easily available from most major supermarkets and health food stores. This syrup is gluten and wheat free, making it ideal for those with a gluten intolerance. It is also fructose-free, so is a popular option for people with IBS or anyone who cannot consume fructose. But with a GI of 98, (higher than table sugar), it can cause blood sugar spikes and crashes, so I would advise being conservative in its use and pairing it with low GI foods to stabilize blood sugar levels. Coconut sugar is produced from the coconut tree. Sap from the coconut palm is heated to evaporate its water content and reduce it to granules. It has a similar color and taste to brown sugar. Coconut sugar is very low in fructose and scores low on the glycemic index. It is a rich source of potassium, magnesium, zinc and iron. In addition it also contains Vitamin B1 B2, B3 and B6. When buying be sure that your coconut sugar doesn’t contain cane sugar as an additive. Date sugar is made from dried dates. The fruit is first dehydrated then ground to produce the sugar. A great natural sweetener, it retains all the vitamins, minerals and fiber that is found in whole dates. It has a rich sweet flavour that makes it an ideal alternative to brown sugar with fewer calories. Unfortunately it doesn’t dissolve well making it more suitable for baking rather than using in smoothies and drinks. Although high in fructose, honey has many health benefits and so deserves to be on this list. But it is raw honey that we refer to here not the artificial version sold in supermarkets with much of the nutrition removed. Raw honey is a natural sweetener made by bees. Honey is much sweeter than sugar, with more calories, so you need to use less of it. Honey has proven medicinal benefits. It contains enzymes, antioxidants, and small amounts of vitamins and minerals and does not upset the body’s mineral balance as much as refined sugar. Pure maple syrup is the concentrated sap of the maple tree made by boiling down the sap. However, do make sure you buy pure maple syrup not maple flavored syrup. This natural sweetener contains small amounts of potassium, calcium, zinc and magnesium. It also contains up to 54 different types of antioxidants, some of which may have anti-cancer properties. Maple syrup has a low GI, making it a good choice for blood glucose control. Yakon syrup is made from the roots of the Yacon plant, which grows only in the South America Andes. The syrup is thick and sweet, but it is low in calories, has no glycemic index and is excellent for the immune system. This is a great natural sugar substitute and goes well with almond milk and oatmeal. However it is very expensive so you may want to look for alternatives. I have not included agave nectar on this list. Agave syrup contains the highest fructose levels of any sweetener (ranging from 70 – 97 percent), worse even than corn syrup. It is made from the filtered, heated sap of the blue agave plant. Yes it does have a low GI index, but this is not the only factor when determining how healthy a sweetener is. Why is high fructose such a problem? It contributes to unhealthy changes in liver function, triglyceride levels and insulin sensitivity. It is also harder to digest than other sugars. So, which are the best sugar substitutes? For smoothies I would recommend fruit or one of the natural sweeteners such as honey or maple syrup. They are easily blended, they add fiber and have some health benefits. But do use them sparingly. If you are looking to lose weight, a low-calorie sweetener such as Stevia will be more your thing. I believe that most sweeteners are still a healthier choice than sugar, except for artificial sweeteners. I would urge you to steer well clear of these. I believe there is still too little known about any potential harmful side effects. But remember, sugar is sugar whatever its form, so less is more.